The Somali national team has made a debut at the bandy world championship. 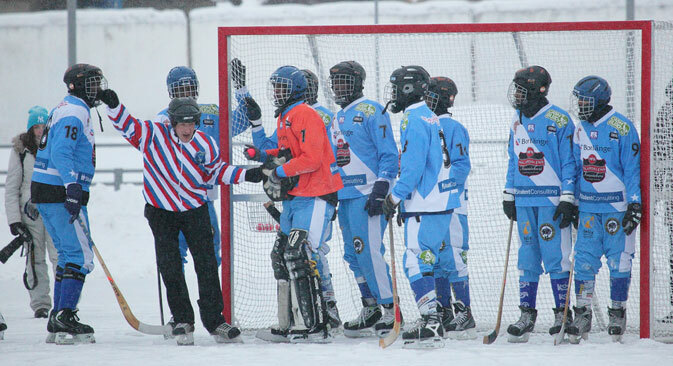 The Somali national team took part in the 2014 Bandy World Championship in Irkutsk (Jan.27-Feb.2). Bandy, also known as Russian hockey, or ice hockey with a ball, is popular in Russia and the Scandinavian countries. It was invented at about the same time as ice hockey played with the puck. For a while, the two games co-existed, but in the 1950s and 1960s bandy was upstaged by regular hockey, which had always been more popular in Canada. The Federation of International Bandy is now trying to popularize the sport in other countries in order to have it included in the Olympic program. The appearance of the Somali national bandy team has been an unexpected product of those efforts. “Our story is more than just about sport," says Patrik Andersson, the manager of the project. “It is an attempt to adapt the Somalis to European life. There are more than 3,000 refugees from Somalia living in the small Swedish town of Borlänge. We have assembled a team, founded the Somali national federation, and are now planning to start up a children’s team as well. Why bandy? Because it is the most Swedish of all games. We want to use it as an example to demonstrate that skin colour doesn't matter. The important thing is that we live together and play together." The Somali team began preparing for the world championship in late summer. It spent three months training with roller skates, before first setting foot on ice in December. Thanks to financial support from the Swedish bandy federation, the Somali team has made it to the world championship, which took place in the Siberian city of Irkutsk on Feb. 2. Siberia met the Africans from Sweden with freezing temperatures of -20 °F. The game of bandy takes place on an open ice rink the size of a soccer pitch; there are two halves of 45 minutes. “Cold weather doesn’t scare me,” said the Somali team’s forward Anwar Khared. “I live in Toronto, and I’ve played ice hockey with friends for the last six years. Last December I found out that the Somali team was going to the play in the world championship in Irkutsk. I am very glad to have an opportunity to join my compatriots. Who knows, maybe some day there will be a covered bandy stadium in Mogadishu, and our team will play for the fans back home in Somalia." The Somali team received a warm welcome in Irkutsk, and its matches had been drawing sizeable crowds. In fact, the Somalis were the main attraction of the entire tournament. The locals had humorously dubbed the team "The Somali Pirates". “We have bought a Somali flag specially for the occasion, and the drum I got from my grandpa,” said Pavel Stepanov, one of the Irkutsk residents who came to the stadium to support the novices from Somalia. "I think I may have some Somali blood in me, so I will be cheering for the Somali team." The Somali team, meanwhile, had been busy posing for photos with fans in Irkutsk, signing autographs, and even making friends with the local girls. The players said they will keep in touch with their new friends in Siberia via Facebook. Alas, the Somali team’s actual performance had been disappointing. It lost to Germany 22 to 1, even though the Germans are also novices. The International Bandy Federation's attempts to have the sport included in the Olympic program are being undermined by the huge difference in the level of the various national teams. Russia had defeated Canada 22:1, while Sweden had demolished the Belarusian team 33:5. For comparison, the final match between the Russians and the Swedes ended in 3:2 in favor of the hosts. As for the Somalia team, its regular participation in the сhampionships has already become a success for the pioneers of African bandy.